Do not trivialize the French know-how exceptional, unique in the world! 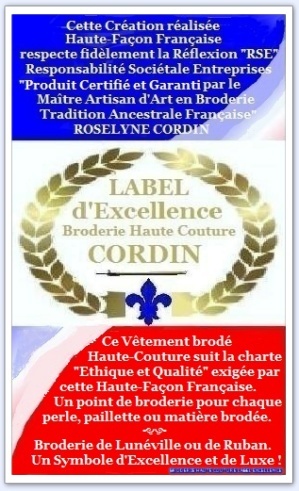 - Recognize them at fair value and recognize the Master Craftsmen French Abroad they rightly !" 1) and DEVELOPPEMENT SUSTAINABLE VALUE ETHIQUE Our insurance brand has very good working conditions and a respected first rate limiting CO2 emissions for transport: All our products are manufactured in same place. The durability, rather than a product DISPOSABLE "! 3) TRACEABILITY : DESIGNED IN PARIS: we create our designs in Paris when we draw our ideas within the capital and seek our raw materials (beads, sequins, etc. ...) MADE TUNISIA IN: Our sourcing is in Tunisia and with this, we pass the exemption from our host country on the price of our labor Haute Couture: 15 €. We do not keep under our charter work of excellence, the quality of our hands, "High-French Way". No traceability and lie to the customer paying too dearly for his product! Our product "MADE IN INDIA" need not be associated with low quality and a cheap workforce. We work in Tunisia, where our company scrupulously follows the articles on the working conditions of the Declaration of Human Rights 1948. Our staff works in a bond room comfortable and very good in a fair and satisfactory work. We ask in our research and manufacture a high quality work, therefore, our employees are qualified and always declared with a specific technical nature, that we pay very decent, well above the national minimum wage and with attractive benefits. Working in collaboration with the Ministry of Education in Tunisia, for future competence "high value added," we respect and apply all the commitments made to our country of adoption, ie all social obligations, and administrative customs! THE PRICE of our BRAND "JAWHARA CREATION" are a true reflection of QUARTET: SUSTAINABLE DEVELOPMENT ETHICS and VALUE, QUALITY, DURABILITY, TRACEABILITY, SOCIAL RESPONSIBILITY .